Work out how long it takes for a drug to leave your body. This is an estimate on the time it will take for a drug to be removed from the body. The actual half-life of the same drug may vary significantly from person to person, because it depends on a number of different patient-specific and drug-specific variables. This tool should NOT be considered as a substitute for any professional medical service, NOR as a substitute for clinical judgement. It should not be relied upon to predict the time period required to ensure a negative drug test result, because laboratory tests mostly test for drug metabolites. 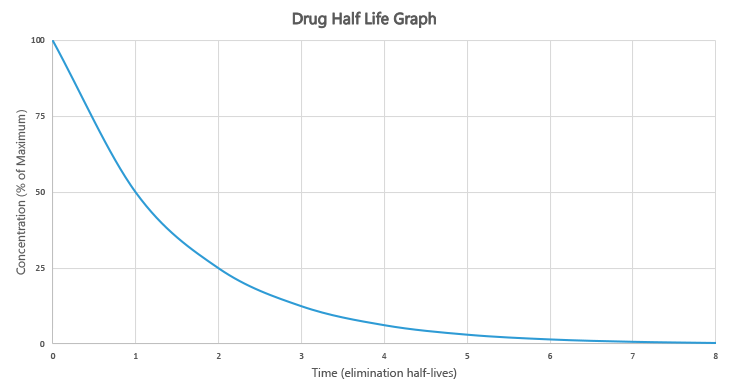 The half-life of a drug is an estimate of the period of time that it takes for the concentration or amount in the body of that drug to be reduced by exactly one half (50%). The symbol for half-life is T½. 300 minutes after administration, 3.125mg remains. In theory, we can see that after 300 minutes, almost 97% of this drug is expected to have been eliminated. Most drugs are considered to have a negligible effect after four-to-five half-lives. However, this does not mean that won’t be detectable, for example, during a drug test. Just that they will have no effect. In reality, the actual half-life of a drug varies from person to person, because it depends on a number of different patient- and drug-specific variables. These affect how well a particular drug is distributed around a person’s body (called the volume of distribution), or how fast a person excretes that drug (called the drug clearance). For example, the IV drug gentamicin, which is cleared through the kidneys, has a half-life of 2-3 hours in a young person with no kidney disease, but over 24 hours in somebody with severe kidney disease. Generally, it is difficult to precisely say how long a drug or substance will take to be excreted from someone’s body. This is an important fact for athletes or people in occupations that require them to be substance-free to remember. Half-lives in the anti-doping world are of limited value because they do not reflect the presence of metabolites (break-down products from the parent drug), which are often what is measured in anti-doping tests. In addition, serum half-life does not necessarily reflect urine concentrations, which is the main sample of choice in drug testing. Other variables, such as if the person is on hemodialysis. Other variables, such as if the drug is actively transported, is self-induced, or has saturation pharmacokinetics. Drugs or substances that have a shorter half-life tend to act very quickly, but their effects wear off rapidly, meaning that they usually need to be taken several times a day to have the same effect. Drugs with a longer half-life may take longer to start working, but their effects persist for longer, and they may only need to be dosed once a day, once a week, once a month, or even less frequently. When considering drugs with a high addiction or dependence potential, those with a short half-life are typically harder to withdraw from than those with a long half-life. For this reason, drug treatment programs will often switch a person from a short-acting drug to a long-acting equivalent from the same class, in order to improve the withdrawal process. * Note that half-life varies depending on source used. Half life in this table refers to the elimination half life. Are expired drugs still safe to take? Can grapefruit juice interact with my medications? How do I avoid errors when taking my prescriptions? How do I manage common drug side effects? How do I prevent a drug interaction? How do I stop my medication safely? Is pill splitting a safe way to save on prescription drug costs? Medical Conversions - How do I convert teaspoons to ml etc...? What are pharmaceutical salt names? What are the risks vs. benefits of medications? What do these medical abbreviations mean on my prescription?